According to Zion Chatt’s records Sarah Rosanna/Roseann/Rose Ann Dodge was born 12 February 1858, while her death certificate gives her date of birth as 12 February 1854. 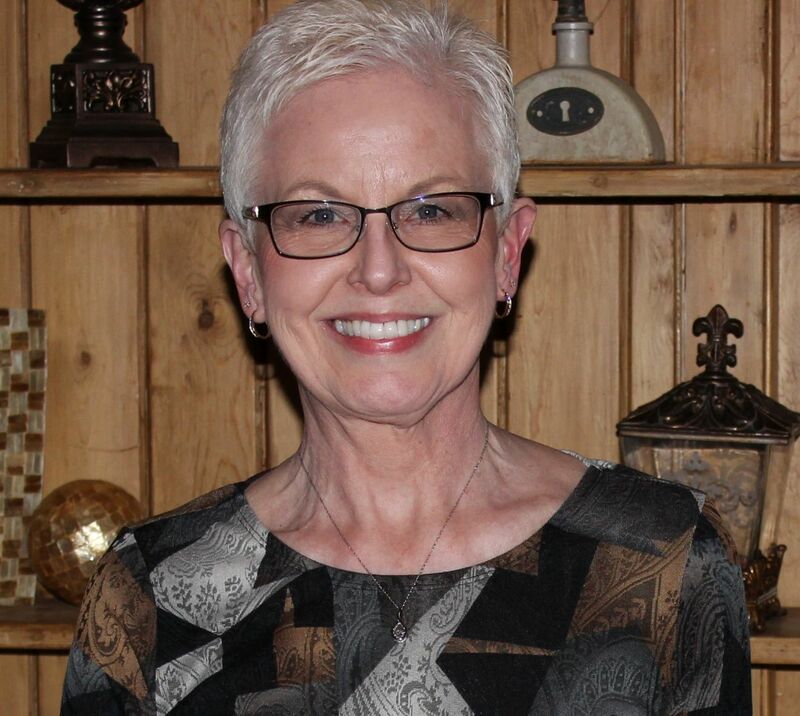 She was born in Jefferson Township, Adams County, Indiana,  the daughter of Hamilton and Mary (Sparks) Dodge. 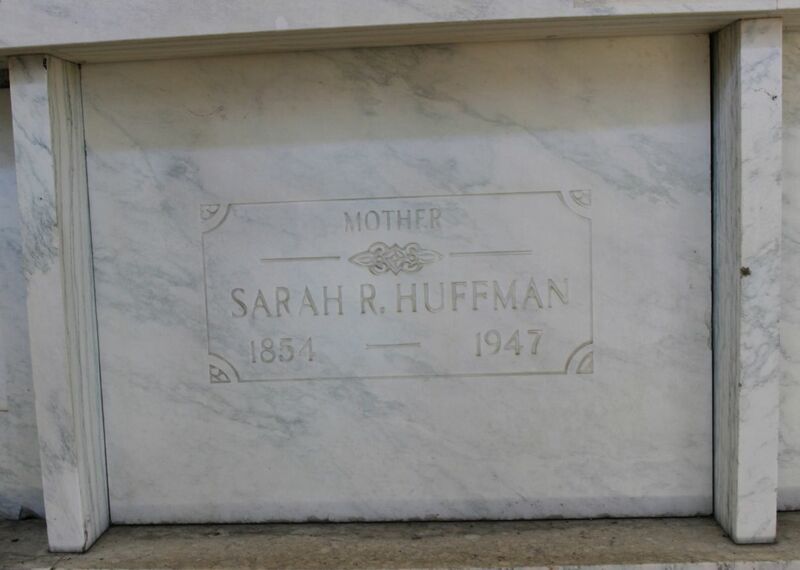 Sarah Rosanna Dodge married George F. Huffman on 16 August 1877 in Adams County, Indiana, married by Thomas E. Macy. George was the son of Ferdinand and Elizabeth (Hartzog/Herzog) Hoffman, born 29 June 1853 in Liberty Township, Mercer County, Ohio. The family attended Zion Chatt for awhile, and daughter Mary Olga’s baptism was recorded in the church records in 1892. She was baptized at the family home. Zion Chatt’s records indicate that Sarah was baptized at Zion Chatt on 21 July 1912 and confirmed there by Rev. L. Loehr on 22 July 1912. George and Sarah moved back to Ohio by 1935 and lived in Chattanooga, where George died 18 January 1937. 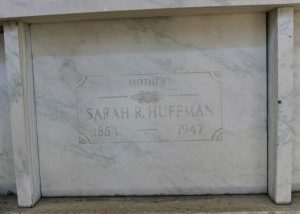 Sarah is buried next to her husband George in the mausoleum. Her father is buried in Kessler Cemetery. Indiana, Death Certificates, 1899-2001, Year 1947, Roll 4, Indiana Archives and Records Administration, Indianapolis, IN; Sarah Rosan Huffman, 4 Apr 1947; Ancestry.com. 1860 U.S. Census, Jefferson Adams, Indiana, p.228, dwelling 1599, family 1578, Hamilton Dodge; Ancestry.com; FHL microfilm 803242, NARA microfilm M653, roll 242. 1870 U.S. Census, Jefferson, Adams, Indiana, p.39B, dwelling & family 65, Hamilton Dodge; Ancestry.com; FHL microfilm 545795, NARA microfilm M593, roll 296. “Indiana Marriages, 1811-2007,” FamilySearch.org, George Hoffman & Rosanna Dodge, 16 Aug 1877; Adams County Marriages, FHL microfilm 2321470. 1880 U.S. Census, Liberty, Mercer, Ohio, ED 188, p.474C, dwelling 50, family 53, George Hoffman; Ancestry.com; FHL microfilm 1255048, NARA microfilm T9, roll 1048. 1910 U.S. Census, Jefferson, Adams, Indiana, Ed 4, p.2A, dwelling & family 34, George Huffman; Ancestry.com; FHL microfilm 1374351, NARA microfilm T624, roll 338. 1920 U.S. Census, Jefferson, Adams, Indiana, ED 4, p.7B, dwelling 148, visited 158, George F Huffman; Ancestry.com; NARA microfilm T625, roll 420. 1930 U.S. Census, Jefferson, Adams, Indiana, ED 4, p.4B, dwelling 94, family 95, George F Huffman; Ancestry.com; FHL microfilm 2340309, NARA microfilm T626, roll 574. 1940 U.S. Census, ED 54-22, p.15A, line 23, Sarah Huffman; Ancestry.com; NARA microfilm T627, roll 3114.